When OnePlus announced its first phone back in 2014, it was just a small company with an ambitious tagline for its phone. The “flagship killer,” they called it. In a market as tight as the smartphone space, it seemed hopeless for a new third party manufacturer to get in the game. In hindsight, the OnePlus One had already fulfilled that tagline in many ways—and was really only a foreshadowing of what would come. Two years later, against all odds, this small phone manufacturer has released its third flagship smartphone and its fourth smartphone altogether. The OnePlus 3 is an iteration of its previous versions, but it really feels like the company went back to the drawing board with this one—and that’s a good thing. A really good thing. After unwrapping the beautiful box and packing (yes, I just called a smartphone’s packing beautiful), the first real thing you’ll notice about the OnePlus 3 is what this phone is made of. The OnePlus One and OnePlus 2 both came with removable backs—which meant they were made of plastic. The construction was always tight though and the unique scratchy texture on the backs always felt pretty nice in the hand. With the OnePlus 3, however, the company has switched over to what you’ll find more on devices like the iPhone or the HTC 10. It’s a unibody design made entirely of aluminum on the sides and back—with Gorilla Glass 4 on the front. In the hand, it feels very similar to holding an iPhone 6s Plus—mostly, that it feels incredibly light and thin, as well as a tad slippery. If you’re coming from recent Android phones with more meat to them such as the Moto X Pure Edition, Nexus 6P, or the HTC 10, the OnePlus 3 will feel very slippery—and with how premium it feels, you’ll want to put it in a case right away. As someone who hates cases though, it only took me a couple of days of using the OnePlus 3 as my daily driver to get used to the weight and texture. Overall, I can tell you the transition to getting used to this phone will be well worth it. The device is a both a beauty to hold and beauty to behold. Size-wise, we’re talking about a very thin and light phone—moreso than any device at the 5.5-inch size and moreso than most phones that are even smaller. It’s hard to believe how OnePlus fit everything they did into such a thin frame without compromising any of the important aspects of a flagship smartphone. While I’ll admit to preferring and being used to larger phones, the OnePlus 3 really fits into that sweet spot where you get a large, immersive AMOLED screen without a massive footprint (like the iPhone 6s Plus). The careful attention that was put into the design of the OnePlus 3 really sets this phone apart. The volume rocker and power button are stiff and clicky—and little touches such as the notification LED and alert slider are nice additions. My one complaint—and it’s fairly minor—is I still don’t love the fingerprint scanner that looks like a power button but isn’t a button. It works great and is really responsive for unlocking the phone, but it throws me off that it looks like a power button, but doesn’t function as one. In terms of some of the important specs to know about here, you’ve got the standard Snapdragon 820 for the onboard chipset, 6GB of RAM, and a 16-megapixel camera on the back. The OnePlus 3 is fantastic in terms of performance—everything from opening apps to playing games feels buttery and smooth. As you may have heard, the OnePlus 3 only uses four out of the six available GBs of RAM to increase battery life performance. The choice seems like a bit of a last-minute decision by OnePlus and I can see why people might get frustrated that they paid for 2GB of RAM that they can’t use. However, I can’t help but agree with the decision because the OnePlus 3 is quite impressive in both battery life and performance. Speaking of the battery life, that’s another aspect where I was impressed. It’s nothing out of the ordinary, but you get full days worth—and on some less heavy use days, I still had over 30% left in the tank. The bigger surprise was the rear shooter, which is one of the very best Android cameras out there. When it comes down to comparing it against the best, such as the Galaxy S7, LG G5, and iPhone 6s Plus, we’re talking about nitpicks and small differences in output. It’s got some great depth of field and produces some really sharp images, even when zoomed in. Lowlight performance is good enough, but probably not as good as the iPhone 6s Plus or Galaxy S7. Even still, the OnePlus 3 has a very capable camera that captures fast and produces great images. The OnePlus 3 comes with OxygenOS, which is very light skin placed over Android 6.0. The experience of using the OnePlus 3’s OS is refreshing if you’re coming from a Samsung or LG device, as what you’re getting here is very close to stock Android. No bloatware, no ugly menus, and pretty much added that you can’t turn off in the settings. The few things that OnePlus has added here are either helpful or customized. After playing with the OnePlus launcher for a few minutes, I quickly switched back to the Google Now launcher. While what you get with the OnePlus Shelf isn’t terrible, I’ve found that having pretty much anything there other than my Google Now cards just doesn’t work for me. What do you get is some shortcuts to apps, some contacts, and some widgets—kind of like what Apple has done in its Siri launcher. As for features that actually are helpful, you get a handy Night Mode (which gives you quick access to the color balance of the screen), as well as a Dark Mode—both of which are great. Other helpful things you get here are double tap to wake (which is nice for a phone without a home button) and gestures that let you open the camera or flashlight by drawing on the screen. The main point here is that OxygenOS is subtle and only seeks to enhance the stock Android experience—not replace it. 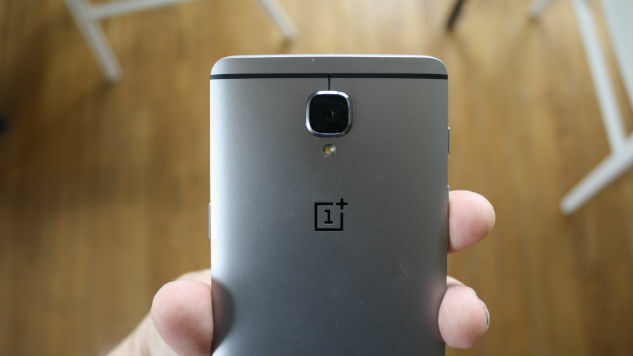 What OnePlus has done with its newest smartphone is not just impressive—it’s astounding. Even if OnePlus wasn’t almost half the price of phones like the Galaxy S7 and a hundred bucks cheaper than the Nexus 6P, I’d still be giving the OnePlus 3 the award of best Android smartphone. It’s just that good. The fact that it not only surpasses most flagship phones on most levels, but also does it for an affordable price makes the OnePlus 3 a gamechanger. There’s no longer any reasons to buy a midrange phone and there’s no longer any excuses for large phone manufacturers to put out sloppily made flagship devices. The OnePlus 3 is the phone that HTC has been trying to make for the last few years. It’s also the device that has set a new standard for not only budget smartphones, but for Android phones in general. This is the one iPhone refugees have been waiting for.